Every time you make a sum resulting in a target number (upper left corner)., you score points. Your score is shown in the upper right corner of your screen. How do I earn more points? The more steps you used in a sum, the more points you score. 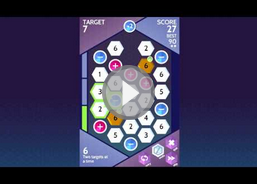 Bonuses stick to the number tiles until you use them to reach a target. How do I earn more stars? More points equals more stars. This is the number of new tiles you get for clearing all targets. If no refill is displayed all tiles are replaced. We compare your scores to the rest of the world! If you're in the top 25%, we'll give you a special diamond! The top 1% gets the prestigious red diamond. What about the order op operations? SUMICO works similar to a calculator. Operators are applied as you swipe the tiles.